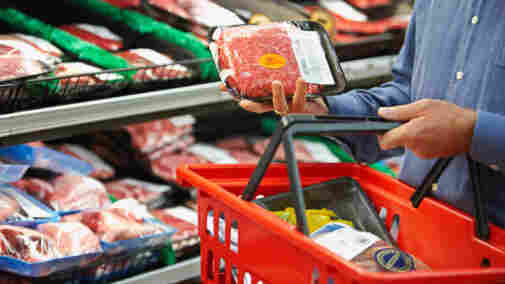 Meat Contamination Is Top Concern : Shots - Health News Recalls of tainted lettuce, ground beef laced with a dangerous E. coli strain, and the giant oil spill in the Gulf have dented the public's perception of food safety. Government officials have said for years that the U.S. has the safest food supply in the world. But recent events aren't doing much to inspire confidence in that mantra. Recalls of tainted lettuce, ground beef laced with dangerous E. coli 0157:H7 strain, and the giant oil spill in the Gulf, have dented the public's perception of food safety. According to a national survey conducted for NPR by Thomson Reuters and released today, 61 percent are concerned about contamination of the food supply. Most of them — 51 percent — worry most about meat. That doesn't stop us from consuming about 63 pounds of beef per person per year, mind you. But meat safety is a big concern compared with the 25 percent of people who worry most about seafood and the 23 percent who fret most about produce. Dairy got a pretty low 4 percent response. Thomson Reuters says the margin for error on the results is plus or minus 1.8 percent. More than a third of the 3,000 survey respondents said their fear of seafood contamination has increased over the last three months — roughly the same amount of time the oil has been spilling into the Gulf of Mexico from the BP disaster. But not everyone agrees on what to do to fix the problems. In our Thomson Reuters survey, more people said food companies should improve their quality control systems, rather than calling for more inspections, oversight or stiffer penalties. Consumers Union, which did its own survey recently, took it a step further. The group asked 1,000 people whether Congress should pass a law to give the Food and Drug Administration the power to force food companies to recall tainted products. It's one of the key provisions in a bipartisan food safety bill that passed the House last year but is languishing in the Senate. The FDA, which is responsible for most of the food supply, has come under fire in recent months for failing to address gaps in the food safety system. "The number of people killed annually by something they ate is roughly the same as the number of Americans who've been killed in Iraq and Afghanistan since 2003," said Fast Food Nation author Eric Schlosser in the New York Times. That's about 5,000 deaths a year, according to CDC data. But a lot more people get sick from eating something bad — 78 million a year, including 325,000 hospitalizations, says CDC. Ten percent of the people in our survey said they got sick from something they ate in the last six months, and more than a quarter of them sought medical care. The Produce Safety Project at Georgetown University says illnesses and hospitalizations from foodborne illness cost us more than $150 billion a year.